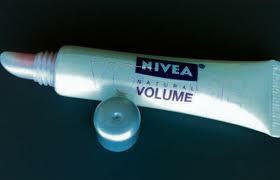 Nivea Natural Volume Lip Gloss. I just purchased the new Nivea Natural Volume Lip Gloss and I am LOVING it. It gives my pucker a super sheer, glossy, rose tint and is uber moisturizing. The "volumizing effect" it total B.S. though, as it is with most lip products, so don't purchase it if you're looking for Angelina lips. The scent and taste is nothing to rave about either, but isn't terrible. I would recommend this gloss for anyone who hates wearing lipstick, or has dry lips, but likes a touch of colour. I picked mine up at Shopper's for $4.99 CAD. thanks for the heads up on this product.